Tenochtitlan, capital of Aztec Empire, was one of the biggest and richest mercantile centres of Mexico Pre-hispanic. The trade was performed in the tianquistli (marketplace), due to lack of stores the tianquistli was installed every 5 days in the squares of city. 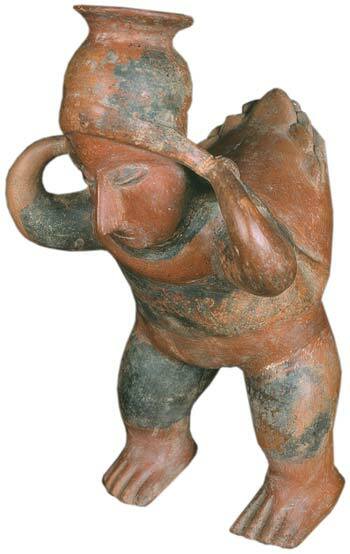 The principal actors of commerce were known as pochtecas, they were travel-traders that walked long distances to get luxury ceramics, feather of tropical birds, gold, jewellery of jade, turquoise or obsidian, animal leathers, etc. Basically, these dealers “import” to Aztec Empire goods of opulence, of limited access and strategic; in this way, trade became a pillar of social and political status among the towns of Mesoamerica. Although few authors explains that commerce was an activity uncontrolled by government, some versions confirms that pochtecas were commissioned by governors of some towns to get garments or specific articles that were difficult to find around their territory; we can mention cocoa or seashells as those goods highly wished but hardly found in their marketplaces. Nevertheless, pochtecas couldn´t do trade alone, they needed transportation. Prior to the arrival of Spanish, horses, donkeys or oxen were not acknowledged in Mexico, then the ground freights were handled by tlamamas, tlamemes or tlamamani (these are the different names as can be found in bibliography) but better known as tamemes which is the Hispanic form of the etymology from náhuatl, it means “load in back” o “human porter”. Tamemes used to walk approximate distances of 5 leagues (25 kilometres or 15.5 miles) carrying around 2 arrobas (23 kilograms o 50 pounds) before being replaced. Tamemes were well organized; there are registers of bill of ladings and shipping paperwork of that epoch. In fact, distances and weight mentioned above are jus an average for reference, there are evidences of heavier loads and longer distances assigned to mature adults and lighter and shorter for children who were trained to be the future tamemes. 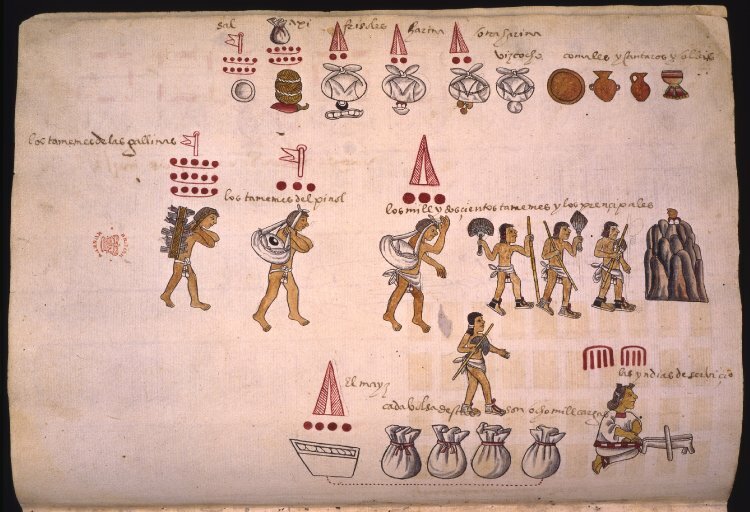 The picture below was taken from the Codex Kingsborough, where is mentioned a detailed planning of logistics, quantities of salt, beans, chilli and other products transported by “one thousand two hundred tamemes” are described in the document. Tamemes used the mecapalli, it is a band of cotton or ixtle (fiber of maguey/agave) tied together with two ropes that holds the shipment or tlamamalli, as the cargo is called in náhuatl. In some cases, it was necessary adapt the load capacity, so they utilized the uacallis and the cacaxtlis, they are a kind of wood boxes were they transported animals or fragile objects as clay pots or ceramics. Liquids and seeds were carried in tenates or jícaras, they were pots of different materials. All these instruments for “freights” were highly valued, even they were considered as merchandises object of tribute. 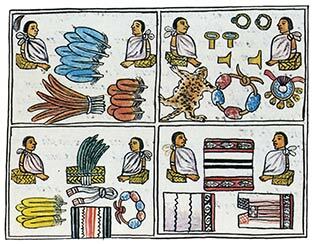 As I mentioned, the merchandises traded and transported were sumptuous goods for high society of Aztecs, but the Tamemes carried as well good of common usage as corn, firewood and sugar canes. 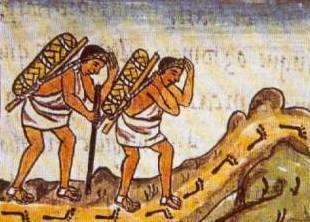 Aztec governors hired services of tamemes to bring or take the tribute imposed among the townships. Why am I telling you this story? Well, I think important to recall the origin of our passions, mine is logistics, what is yours? Maybe if you research a bit you can find an exciting and inspirational history like this one. It could help you to remember why you did choose your career and understand some basics of your daily activities. Are you proud of being logistician, accountant or lawyer? Hope yes. Nowadays, the tameme is fairly the shape of the statuette of the National Award of Logistics in Mexico organized by #SoyLogístico Association, in which I proudly belong to as Founder Counsellor. 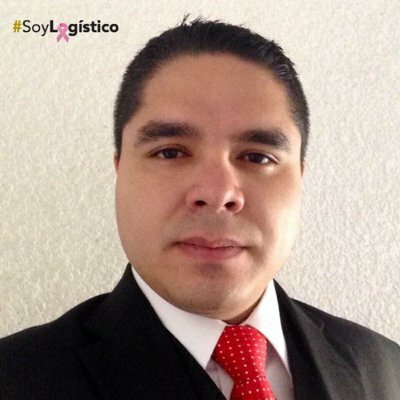 I want to comment that yesterday we had a meeting to generate the mission, vision, values and other strategic elements of this Association; I can affirm that #SoyLogístico is the association that every professional of logistics in Mexico wants belong to. Such as pre-hispanic tamemes did, we want to unify and organize this industry of professionals of logistics looking for keep adding value to the supply chain of Mexico. Keep pending to join it. Thanks for reading and until next one! Ahora aterrizo que actividades que realizamos diariamente en nuestras labores, no son novedad, igualmente puedo considerar que mucho tiempo atrás, ya existían actos comerciales, efectuado por medio del trueque o derivados de diferentes maneras de pago, no como las conocemos hoy, pero aun así existiendo un intercambio de mercancías con el propósito de cubrir las necesidades de la población. Un punto mas, aparte de la logística prehispánica, considero existente en el pasado la cadena de suministro, ya que sin ella no existiría ese “eslabonamiento” eficiente y adecuado entre mercancías y las partes relacionadas con el intercambio. Gracias por compartir historia logística de México. Currently in Mexico it remains very important the tianquistli ( Tianguis or market) as it is an important engine Mexican local economy . For us the Mexican trade is a fundamental part of our culture , in fact the marketing of goods and services remains similar to mesoamericana .